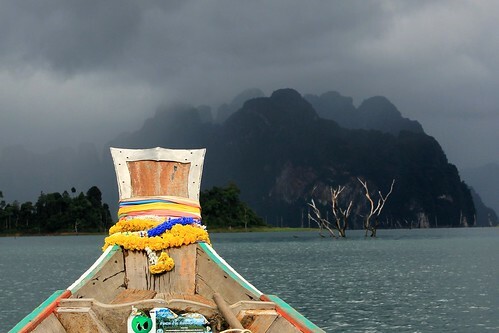 Khao Sok National Park, despite not having a coastal scene, has some of Thailand’s most spectacular scenery. We took a longtail boat through the lake, which is surrounded by incredible limestone hills that reminded us of Halong Bay in Vietnam and Yangshuo in China. It was stormy the day we arrived, but that only added to the mysterious appeal of the landscape. Lovely photo, Ashley & Justin! Thanks, we’ll definitely check it out! This is a beautiful photo!I agree it does remind me of Halong Bay in Vietnam and Yangshuo in China!! Thanks, I think may have used a flash, it was really dark that day! I love this picture – dead moody! Thanks, it was very moody on that lake, and we ended up getting POURED on by those clouds for more than half the trip! I love the striking different of the colorful boat image against the “forbidden” looking landscape you are heading towards. Many of your photos have been amazing on your journey Ashley. Thank you so much for sharing them with us all.